We were waiting to hear from our coordinator when our conference call would take place. Today we found out it will be September 16 at 2:00pm. We will have about three separate forms and checklists we will be discussing for about an hour and a half. We will be talking with our social worker (who did our home study) and the China coordinator. They will discuss all of the special needs we are open to, the next steps as we wait for a referral, and maybe even how soon we will get a referral. This call will be the last step until we are officially in what is considered the "Waiting Child" program. We will be eligible for a match after this call. Our agency receives files every 2-3 weeks to try and find matches. My husband and I had a long talk last night about how we have been handling this waiting period. I had been feeling a little irritated and stressed lately. I did not connect that with the adoption until last night. I have really come to accept the fact that I will NOT know the time-frame of bringing her home. However, both us realized that we were still anxious about something. We finally figured out that we were feeling uncertain - but in different ways - concerning our future daughter's special physical needs. He was feeling anxious about how severe her need would be. So many times we've heard wonderful stories of a family bringing their child home, only to find out that the medical condition was never there, or the child was healed! However, for every good story, we've heard the opposite as well. Children are brought home, only to be found to be much worse than what was originally reported. My husband was feeling anxious thinking that. Even when we find out what type of medical condition she has, we won't really know the extent until we bring her home. My anxiety was focused more of when we bring her home - what we will do. I am thinking about what type of therapy and care she will need when she gets home. I have three other children to care for, and thinking about a child that will need a lot of physical therapy, surgeries, or other treatments is a little overwhelming. I started thinking we might get to home school anymore, or I might need to higher a sitter more often for doctor's appointments and therapy. We are both overwhelmed because of the unknown. We are open to a wide variety of special needs. I realize that not all adoptive parents are. We only chose the special needs we did because we evaluated what would be best for our family. In addition to others, we are open to clef lip/palatte, heart conditions, missing limbs, birthmarks, and even epilepsy. 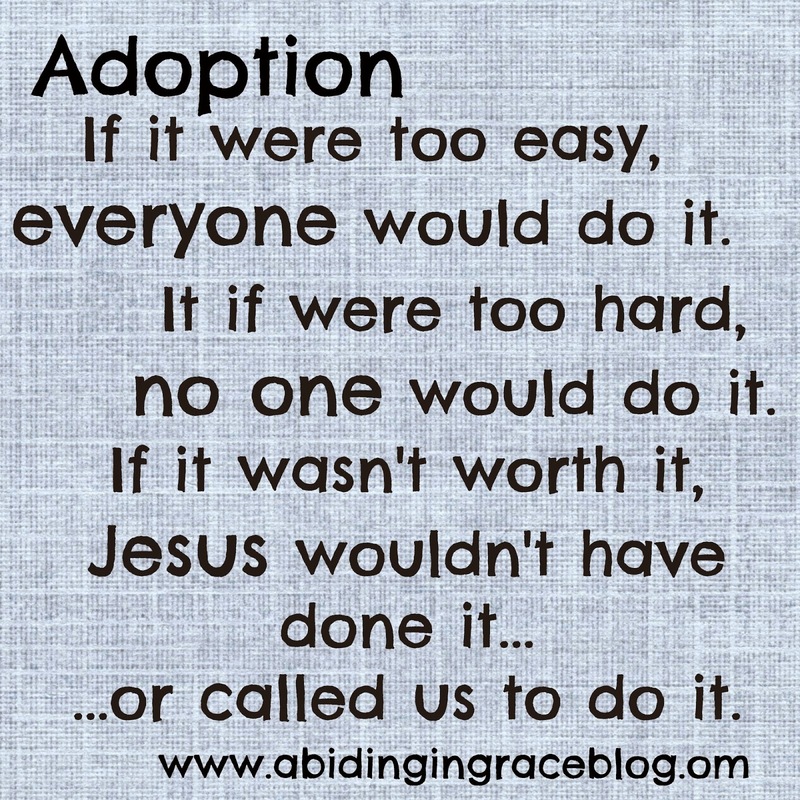 We are not questioning our decision to adopt, or even to adopt a child with special needs. We are only worried about the unknowns. Fear of the unknown can paralyze. We both realized that this fear of our daughter's unknowns was pointing us to a simple truth: We need to trust God. It is simple: Trust God. It is not simple: How do you trust God when you have no idea if your child will need physical therapy, speech therapy, surgery, or all of the above? How do you trust God when you cannot "plan ahead"? I'm a BIG planner.... How do you trust God when you cannot see the future? A simple answer: The past. God has proven Himself in the past. His Word is full of promises fulfilled. Our lives are proof that God is faithful and protects His own. 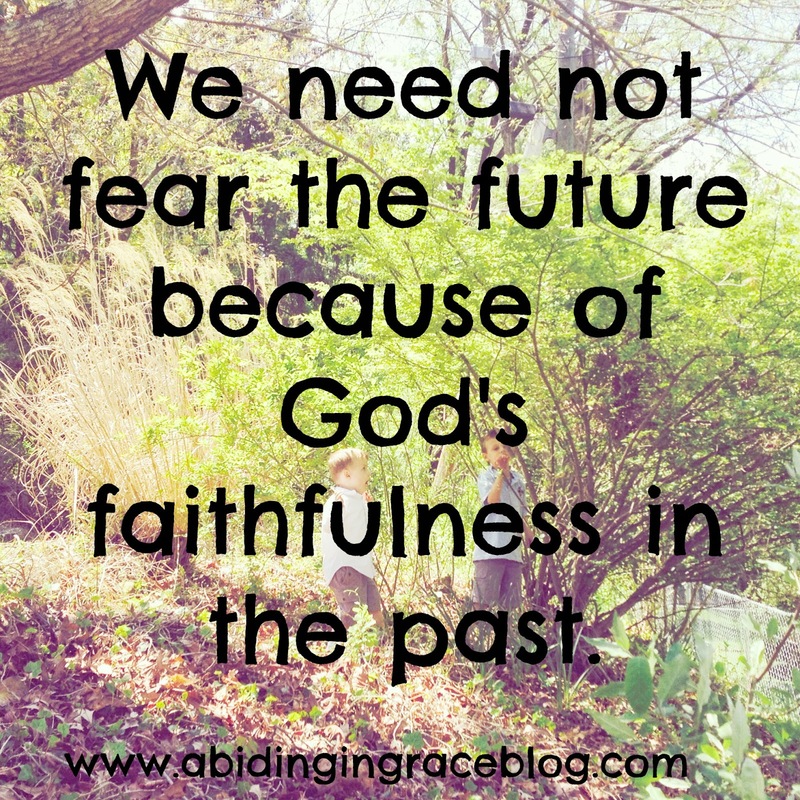 We need not fear the future because of His faithfulness in the past. We are praying that God will give us more faith and that we will be able to trust Him more with our daughter's future physical special needs. Our conference call will bring us a lot closer to meeting her and then bringing her home. It might also provide a better time-frame of what we can expect from here on out. It might even calm our fears when we discuss all the medical needs we are open to. However, to truly calm our fears, our focus should be God. 1. Pray that we will be able to trust God more with the future of our daughter's physical needs. 2. Pray that we will be able to prepare well for the conference call. 3. On Sept. 16, pray that we will be able to have a good conversation with our social worker and the China coordinator. If it were too easy, everyone would do it. It if were too hard, no one would do it. If it wasn't worth it, Jesus wouldn't have done it...or called us to do it. It is worth it. She is worth it.